Our youngest son isn’t quite a year old yet. He recently mastered crawling. 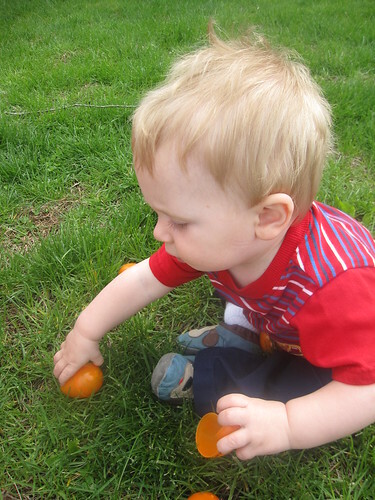 On Easter Sunday, when his older siblings were happily hunting eggs, we assumed that our youngest would be content to just watch his older siblings find eggs. Nope. He wanted to follow them around. He wasn’t content to just do that, either. He wanted to find his own eggs. So he did. If a baby can take the initiative to do complex things for himself, why can’t I take on the big challenges in my own life? Dan McLaughlin quit his job in April of last year to become a professional golfer. The catch? He doesn’t have great physical skills, nor has he played much golf in his life. Instead, he’s trying to do this using the “10,000 hours of practice” model for mastery. Simply put, he’s engaging in six hours of deliberate golf practice a day and hopes to try out for the PGA tour in late 2015. That’s a mighty impressive story, and he’s sharing it all online at TheDanPlan.com. My sister-in-law has a ring with this inscribed on it. Those are some words to live by, indeed. Here’s the clip from the movie. Ray, people will come, Ray. They’ll come to Iowa for reasons they can’t even fathom. They’ll turn up your driveway, not knowing for sure why they’re doing it. They’ll arrive at your door as innocent as children, longing for the past. “Of course, we won’t mind if you have a look around,” you’ll say. “It’s only twenty dollars per person.” They’ll pass over the money without even thinking about it; for it is money they have and peace they lack. And they’ll walk out to the bleachers, and sit in shirt-sleeves on a perfect afternoon. They’ll find they have reserved seats somewhere along one of the baselines, where they sat when they were children and cheered their heroes. And they’ll watch the game, and it’ll be as if they’d dipped themselves in magic waters. The memories will be so thick, they’ll have to brush them away from their faces. The one constant through all the years, Ray, has been baseball. America has rolled by like an army of steamrollers. It’s been erased like a blackboard, rebuilt, and erased again. But baseball has marked the time. This field, this game, is a part of our past, Ray. It reminds us of all that once was good, and it could be again. Oh, people will come, Ray. People will most definitely come. I watched baseball with my grandfather when I was a very young boy. I’ve watched and listened to more baseball games with my father than I can ever count. Last summer, I got the chance to take my oldest son to a baseball game for the first time. During one moment in that game, I sat there in the stands with my dad and my son and for just a moment, I felt like my grandpa was there, too, along with a few other deceased family members. My grandpa never got to meet any of my children, but when I saw the excitement of my son jumping up and down as a player hit a ball deep into the outfield, I remembered my own excitement watching the same thing as a boy, and I’m sure my father felt a bit of the same. I’m willing to bet that my grandpa had that same experience. It’s something that two people I care about very much can share, even though they’ll never meet in this world. They share a few genes and a middle name and perhaps a bit more. Baseball has started again. I think I’ll be going to a game soon. Sarah and I are constantly looking for interesting arts and crafts projects for our children on the weekends (and sometimes on weeknights). Lately, we’ve found a ton of them on instructables.com. This site basically exists to give visual walkthroughs of simple do-it-yourself projects of all kinds. I’ve found great how-tos on all kinds of different things. A great example: this weekend, when it’s raining, my oldest son and I are going to make some ninja stars. Today is full of possibilities. Yesterday, not so much. Don’t dwell on the past. It can’t be undone. Dwell instead on the present and what it can lead to in the future. My children are really into art as of late. 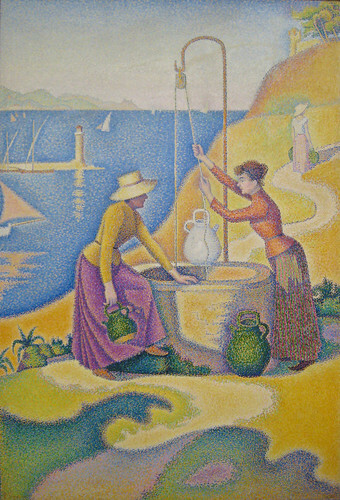 After thoroughly looking at images of van Gogh’s works for the past few months, we’ve started looking at some other post-impressionists. I showed this one to my daughter. She stared at it, entranced, for a long time. Watching her eyes as she looked at this painting was a marvelous experience. She’s three years old and wants to travel to New York to visit the Museum of Modern Art and the Metropolitan Museum of Art. My five year old son is almost as enthusiastic. How soon can we go? Over this past week, I’ve been bicycling all over near where I live, looking for routes to ride on non-windy afternoons. It’s been fun finding them and noting which ones were challenging and which ones were easy. I wanted to record my rides and get some mileage estimates. MapMyRide does exactly that – and makes it fun. It’s one thing to have a goal. It’s another thing entirely to think that by merely having a goal, you’ve already succeeded. Nothing in this world happens without action. Goals and dreams just give your actions some direction. This is a duet by Billy Bragg and Natalie Merchant (with music by Wilco) of a song written by Woody Guthrie. Songs can just take you back to a certain point in your life. This song makes me think of the time when my wife and I were just dating and I was still in college. I remember bicycling through a rainstorm to meet her one Friday afternoon after not having seen her for a month. I got to my apartment and she wasn’t there yet, so I sat on the front step, still in the rain, waiting for her. This song just takes me back there for some reason.